Holiday.gr - Tsagarada, a trip to a myth! 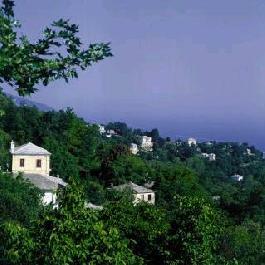 Tsagarada is the most popular village in Pelion. It lies in the east part of Pelion peninsula in a 500 m altitude. It is 62 km from Volos and commands panoramic views. It is a large, sprawling village, which seems built along the peripheral road. Houses can be seen from both sides covering 5 km. Big part of the village is covered by dense forests. Tsagarada consists of four communities (Agii Taxiarches, Agia Paraskevi, Agios Stefanos and Agia Kiryaki), which seem autonomous as they are not close to each other. But they are connected through traditional cobbled alleys. The community of Agia Paraskevi is the center of Tsagarada. Visitors will admire the majestic 1000-year-old plane tree with a circumference of 14 meters at the central square. The region has tall trees, running waters, bridges and stone-built mansions of unexplained beauty. Tsagarada flourished during the 19th century thanks to trade and shipping. The mansions still reminisce of that era. Tsagarada has several churches worth to visit. Agia Paraskevi which was built during the 19th century and the churches of Megas Sotiras and Agios Taxiarhis. All churches have carven chancel screens and excellent icons. 8 km from Tsagarada is the magnificent beach of Milopotamos. It is one of the most beautiful beaches in Pelion, awarded with the Blue Flag by the European Union. It is an organized beach with white sand and turquoise waters. Close to Tsagarada are also the beaches of Fakistra, Karavostasia and Damouhari offering moments of relaxation. Visit one of the nearby taverns and try the local specialties. Rest at a traditional café and enjoy your coffee in a surrounding reminiscing of the past. Tsagarada has hotels and traditional pensions which offer a comfortable and relaxing stay to their guests. Been to Tsagarada ? Share your experiences!